Judith and I have made so many plans to get together to play but something always came up. Today we dodged the snow storm bullet by a day. The first thing that happened is that my vegetarian printing plate cracked. I think I was supposed to cover it. The other thing that happened is that after remelting it and starting to print. the glycerin kept mixing with the acrylic paint. No matter how much I wiped and blotted, the paint behaved badly. Even today after 24 hours, I tried to bag the tray with the plate in it and the glycerin kept getting all over everything. 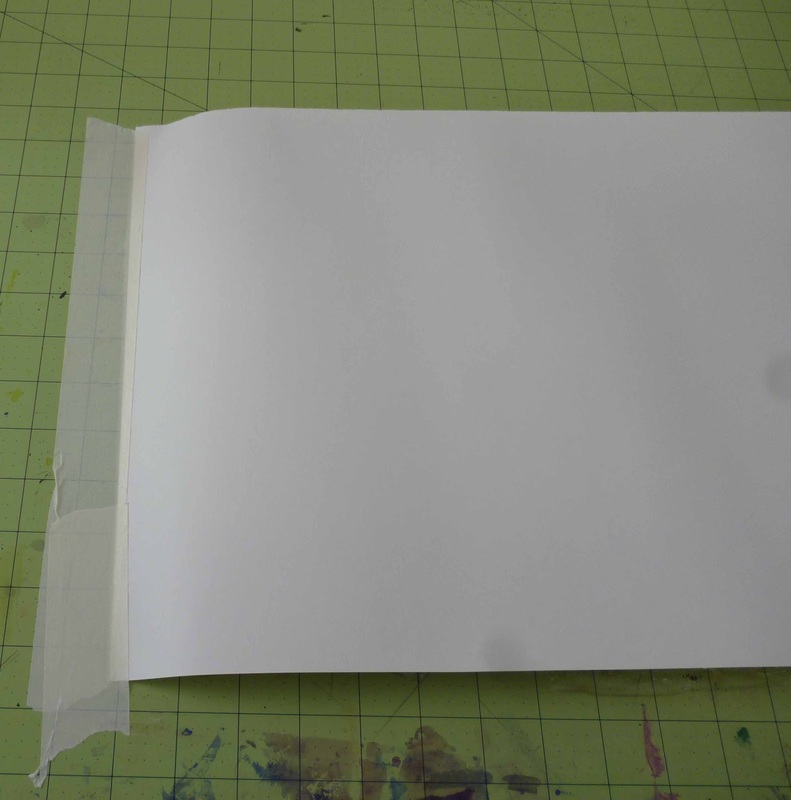 I did use this great registration tip about making a hinge out of tape for multiple colors. This was the 3 color print I made with the vegetarian plate. 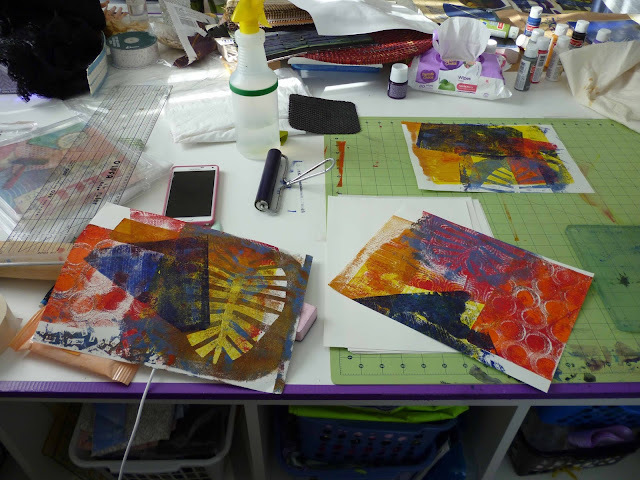 Then I got out my commercial gelli and did some prints on watercolor paper. 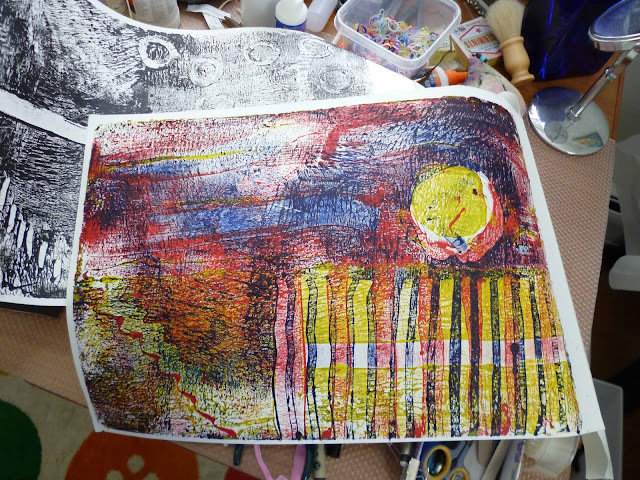 These are ghost prints I made trying to get all the paint off the gelli. All in all I have to say I was disappointed with the vegetarian plate. It was very firm which was good but "greasy" feeling from the glycerin. I will really try to clean that off the surface AND the tray. We may make friends in the future. I also got out my 9 month old Knox gelatin plate and it was still fine. 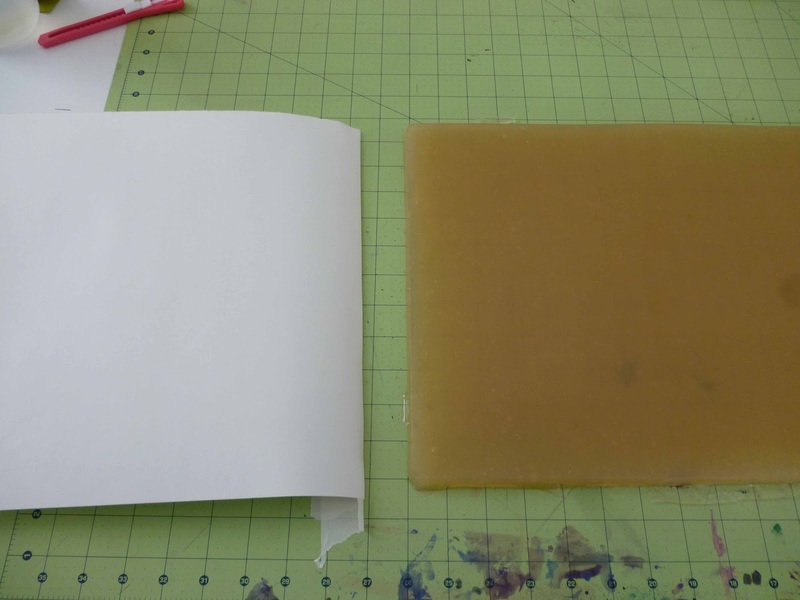 There was some evaporation and it had thinned out so I remelted it and recast it in a smaller ( 8X12) tray. I'm sure I will have more to say about the plates in the future. I hope I can say this in good English. I have the same experience with the glycerin. It stays sticky. What I have don is a thin layer of plain gelatin over it. Its strange but that don't spoil eather. And then it is soft and smooth, not sticky. Too bad your plate broke.Don't give up! 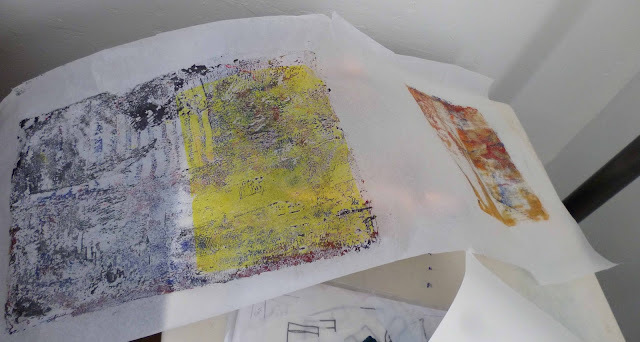 I love the idea of printing, but gave up making my own plate after the first attempt, and have not used my gelli plates very much. Maybe one of these days I will run out of other things to do! Sorry to hear that about the plate. I watched that episode of DMTV and was looking forward to making my own plate. Did you email Laura and ask about it? Too bad about the vegetarian plate but it still looks like you had a productive and fun day. Great prints. Thanks to you and Judith for doing the experimenting for the rest of us. I love your adventurous spirits! I have binge monoprinting, too ! !